This summer I traveled to Guatemala with the intention of learning more about current trends and developments in Guatemalan literary, poetic, and artistic production. In recent years, there has been a surge in not only scholarly, but also literary and artistic production of the “Central American” (including Guatemala) in the United States (See Arturo Arias, Ana Patricia Rodriguez, Kency Cornejo, Claudia Milian). 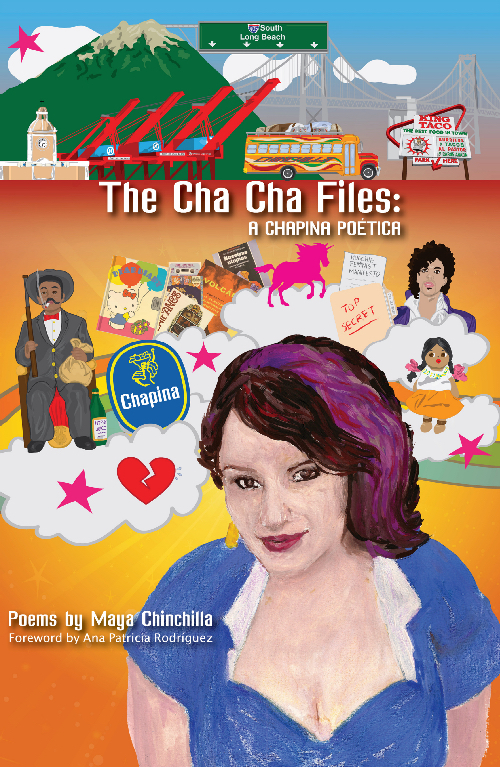 For example, in 2014, Guatemalan-American poet, Maya Chinchilla (Maya Chapina), published her first book, The Cha Cha Files: A Chapina Poética (Kórima Press), marking the first time a Guatemalan-American publishes a book of poetry with themes concerning the Guatemalan/Central American-American experience within the United States. However, her work would perhaps be lesser known within Guatemala. A question arises: what relevance would her poetry have with current Guatemalan literary and artistic trends and, moreover, with Guatemalans, in general, who perhaps have never set foot outside of the country? I came to look for what type of relation might, or might not, exist between literary, artistic, and poetic productions between Guatemalan-Americans and those within the country. This summer was also the first time Maya traveled “back” to Guatemala after 10 years. I had the great privilege of meeting up and conversing with her at the biennial Guatemala Scholars Network (GSN) Conference in Antigua, Guatemala’s former capital, just a 30-minute drive outside of Guatemala City. Her intention on “returning” she states was to conduct research on her family for a current project she is working on. However, given the fact the GSN Conference is largely geared toward sociologists and anthropologists, and only three of us (including Andrew Bentley, a doctoral student in Hispanic Cultural Studies at Michigan State University) were concerned with art and literature in Guatemala, Maya found herself questioning whether her trip to the conference was really beneficial or productive. In other words, what is a Guatemalan-American poet doing at a conference in which the majority of attendees are concerned with issues pertaining to Guatemala only as a country? What interest would people there (besides Bentley or I) have in a poet raised in the United States? The question troubled me a bit as well, but it was precisely the question I came to Guatemala to seek answers for. 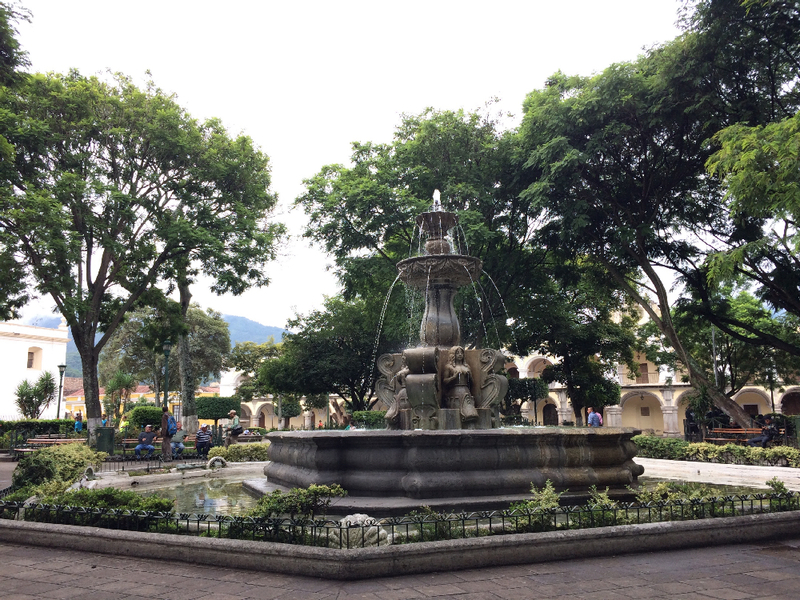 Mermaid Fountain in the Parque Central – Antigua, Guatemala. Photo by MA candidate William Ramirez. After talking to a few of the event’s organizers, we managed to convince them to carve out a little space for Maya to perform one of her poems at the conference’s concluding dinner celebration. When the moment came, Maya stood up, introduced herself, her book, and excused herself for the fact that her poems were mostly written in English. Time was limited, so she went with the poem in her book titled “What It’s Like to Be a Central American Unicorn for Those Who Aren’t.” It quickly became clear that as she started to speak the audience of academic and intellectuals was enthralled. She began to get emotional and the moment culminated when she came to the section in the poem that states, “What if I tell you…/ that I haven’t been ‘back’ in ten years,” and she paused briefly due to the emotion. She literally had not been back to Guatemala in 10 years. Many of us in the audience shed some tears along with her. After she finished, the applause from the audience extended for a good moment. She was an instant hit and had a good number of people approach her hoping to be able to snag a copy of her book. 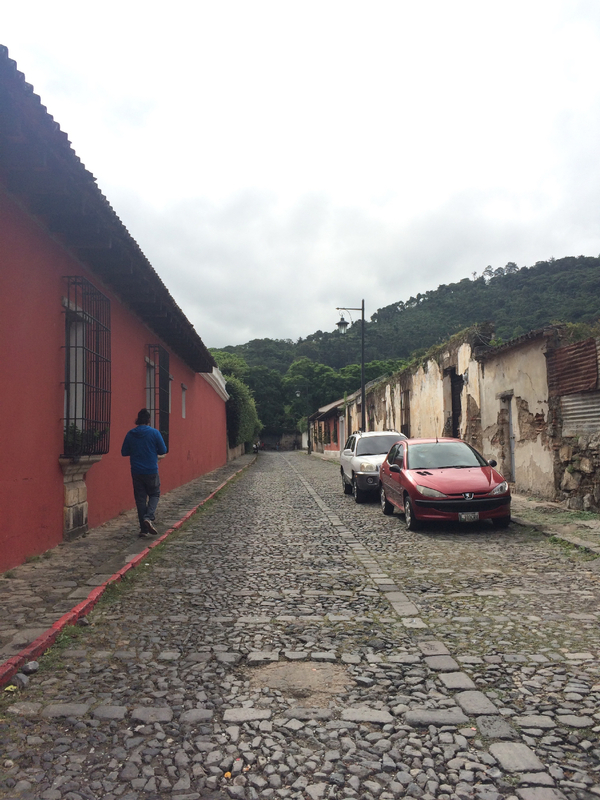 Street – Antigua, Guatemala. Photo by MA candidate William Ramirez. 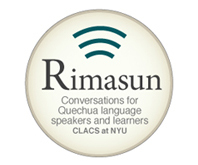 Despite it being a primarily academic audience, I believe their reaction, proved significant and telling in that it demonstrated what an audience concerned with Guatemala, as a country, thinks of Guatemalan-American literary and artistic production, as well as their interest in learning more about the Guatemalan-American experience. It was a small taste of what and how a larger Guatemalan audience might think of, and also react to, other similar work in the future, as well as Guatemalan-Americans’ interest in work produced in the country. This small exchange between Maya and the GSN audience, I believe, may be a positive harbinger for future exchanges and/or collaborations between Guatemalans and Guatemalan-Americans in terms of art, literature, poetry, and other forms of artistic an cultural production. We can only wait and see, but, as of now, the future, from here, looks promising! 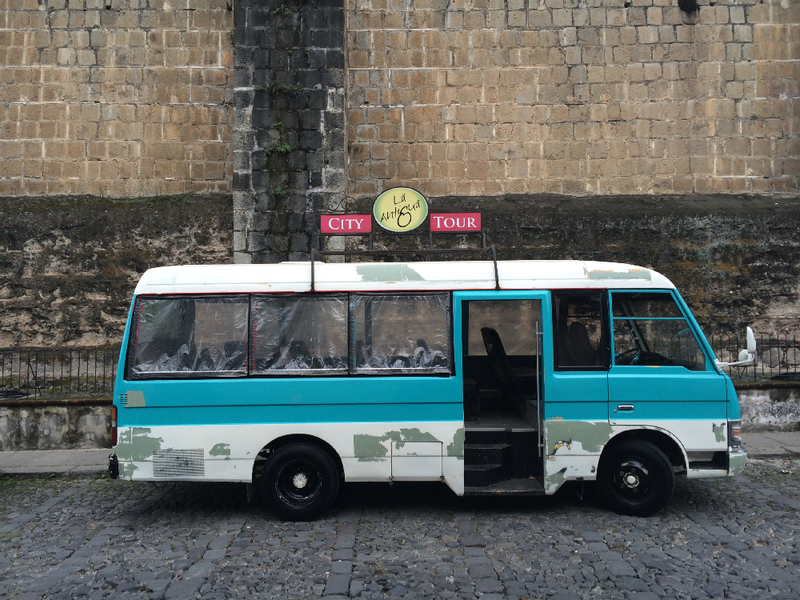 Tourist van – Antigua, Guatemala. Photo by MA candidate William Ramirez. Colonial home wall – Antigua, Guatemala. Photo by MA candidate William Ramirez. 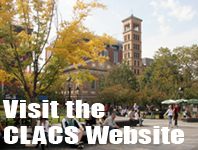 This entry was posted in Recent Research and tagged Guatemala, literature, poetry. Bookmark the permalink. 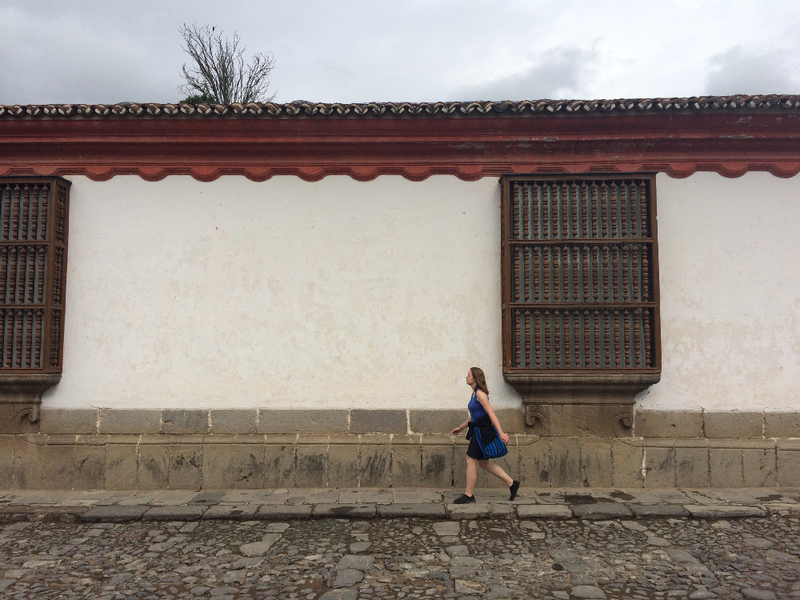 Here is a blog I wrote about my travels and research in Guatemala during the summer of 2015.